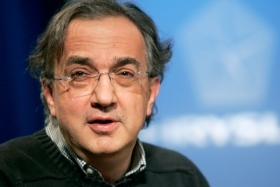 Fiat shareholders will meet Sept. 16 to approve Marchionne's (shown) plan to separate the truckmaking and agricultural units. MILAN -- Fiat Industrial SpA, the unit that will be spun off from Fiat SpA by the end of the year, will have a board with a majority of members who aren’t Fiat executives, company documents show. Fiat shareholders will meet Sept. 16 to approve CEO Sergio Marchionne’s plan to separate the truckmaking and agricultural units. Fiat Industrial’s board will include individuals who don’t currently serve on the board of directors of Fiat or its controlling shareholder Exor SpA or hold senior management positions with either company, Fiat said in a document on its website. “Marchionne wants a high-profile board at Fiat Industrial, which should be independent from the auto division to have two really separate companies,” Alessandro Frigerio, a fund manager at RMJ Sgr in Milan who owns Fiat shares, said in a telephone interview. CNH Global NV, Iveco SpA and the some industrial and marine units will become part of Fiat Industrial. Fiat stockholders will get one share in the new unit, which will be listed on the Milan stock exchange at the beginning of 2011, for every Fiat share they own. Fiat, which owns 20 percent of Chrysler Group LLC, will divide its industrial debt “in substantially equal amounts” between Fiat Group post-demerger and Fiat Industrial, the Turin-based automaker said in the document dated Sept 4. The reason for the spinoff is because capital goods businesses have “fundamentally different characteristics to the automobiles activities in terms of competitive environment, product requirements, level of R&D expenditure required and the profile of potential investors,” Fiat said.